The name Sarong worm came from the worms' ability to wrap itself in a cocoon-like housing much like the lower garment Malay people wear. The worm uses mud sediments and dead leaves along the shore to stick it to themselves. Between these and the worm itself is a very tough plastic-like layer which you may find difficulty in tearing open to get to the worm. The correct way to get the worm out is to squeeze it out like a toothpaste. Slowly squeeze it out from the bottom to the top, making sure each stepping is firm so the worm don't get squeezed in the middle. 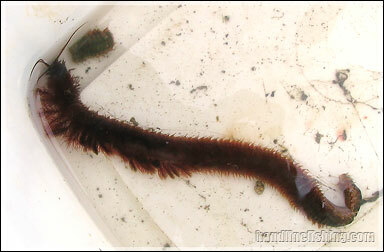 The worm can be used as a whole, or cut into smaller pieces depending on the size or species of fish you're targetting. It is not necessary to pierce the entire worm into the hook, especially on a long one. Just slide the worm so that it covers the entire hook and leave remaining part wriggling to attract fishes' attention. Fishes that you are likely to catch using sarong worms are usually bottom dwelling fishes that resides in muddy or sandy areas. Non predatory fishes like Grunters, Rays, Spotted Sicklefish, Croakers and Emperors usually take the worms readily; juvenile snappers and groupers will also feed on worms. Sarong worms are popularly sold in tackle shops. They are wrapped in newspaper with their tube housing still intact; this keeps will keep the worms alive without water and food for a few days. Sarong worms can also be found in swampy beaches, a portion of the worm is usually protruded out of sand/mud beds and can be seen during low tide. You have to dig around the tube to get the entire chunk of mud out as you can risk breaking the tube or the having the worm retreating deeper down.